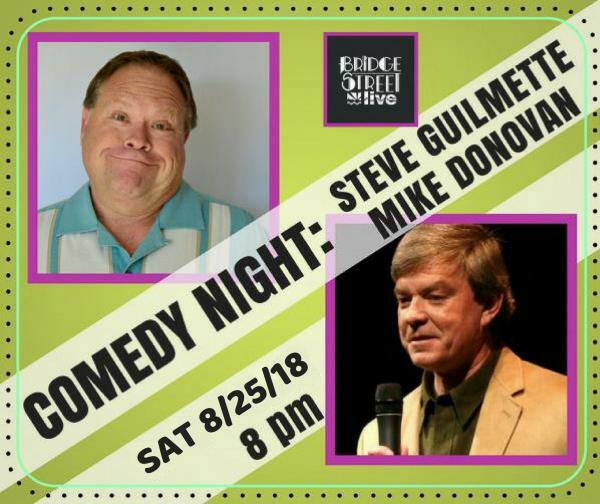 Bridge Street presents a COMEDY NIGHT featuring STEVE GUILMETTE and MIKE DONOVAN on Saturday, August 25th at 8 pm! Steve Guilmette brings a raucous wit and an everyman’s sensibility to the National Comedy scene, receiving a warm and enthusiastic response from audiences throughout the country. Steve has appeared on the "Steve Katsos Show, " "Jerry Caruso Comedy Hour," as well as the "HA HA Haverhill" television shows. He has worked with Gilbert Gottfried, Nick DiPaolo, Jimmy 'J.J.' "Dyn-O-Mite" Walker, Don Gavin, Paul D’Angelo, D.J. Hazard, Paul Nardizzi, Kevin Knox, Frank Santorelli, Patty Ross, Tom Hayes, Joe Yannetty, John David, Jim Colliton, Bob Seibel, Dave Andrews, Paul Gilligan, Tony V, Robbie Printz, Mike Coleman, Lisa Landry, and many other top national acts. Steve is looking forward to bringing the funny to Bridge Street and the people of Connecticut! Boston comedian Mike Donovan has been a headlining stand-up comedian since 1978, touring 38 cities and regularly appearing in Las Vegas, N.Y., and Atlantic City. His sports material has been featured on ESPN's "Sportscenter," and he was a sports talk show host on "The New Sports Huddle with Eddie Andleman." Mike's written work has been published in "Sports Illustrated," "The Patriot Ledger," "Boston Globe," "Boston Herald," "Boston Phoenix," and "Sports Collectors Digest." His book, "101 Stories of American History," was published in November and has been praised for its humor, intelligence, and conversational style!